In the same week that 4-H received a major grant from Google to advance computer science education, the youth development organization today has set even bigger sights for STEM education: For the 10th anniversary of National Youth Science Day (NYSD), 4-H plans to break the Guinness World Record for the World’s Largest Electrical Engineering Lesson. NYSD attracts thousands of youth every year to participate in science experiments that surround a central challenge. Last year, more than 100,000 K–12 students nationwide engaged in engineering through coding and experimenting with drones for NYSD’s Drone Discovery Challenge. After building a wearable fitness tracker, students can monitor their heart rate. Image: 4-H.
On Oct. 3, 4-H expects to draw in thousands of youth to address NYSD’s newest challenge: Incredible Wearables. 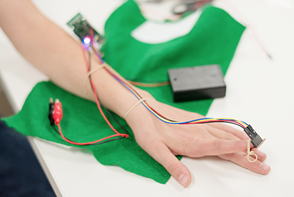 4-H, in collaboration with researchers at the University of Nebraska-Lincoln, created an Incredible Wearables kit for the event that will enable youth to build their own wearable fitness trackers. Through completing the 70- to 90-minute hands-on project, students program a computer sensor to act like a fitness tracker, “learning about electrical engineering and healthy eating in the process,” according to a statement from 4-H. The kit is priced at $24.95; it is geared toward students in grades 4-12 and supports about 4-8 individuals. Interested teachers and students can purchase kits and register to participate in their classrooms; the “World’s Largest Electrical Engineering Lesson” will happen at an event in Brooklyn, NY, according to information from 4-H. Event details can be found on the 4-H site.